I chose to write about mental health for several reasons. We are getting much better at raising awareness of Mental Health issues but we still have a ways to go. I also thought it might be a reference guide for writers who are creating characters that live with themselves or love someone that struggles with mental illness. I also chose this theme to remind myself daily not to get stuck in my grief. Sorry for your losses, and am glad you can fill your life with goodness and greatness. May your posts be catharsis to you and your readers. Thank you Anna. I really hope so too. All I have to do now is finish writing them. Hi Doreen, I am sorry April is a month marked with such sadness. Your theme is perfect, however. Perfectly simple but also deceptively so. You’re definitely a must visit in April (and always actually). Thank you Christina. I am learning so much. I cannot wait to write some crazy characters. I have had a similar year to you, it has been a bit on the bleak side, too. 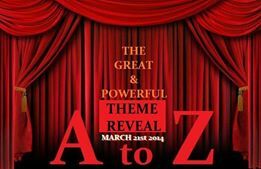 Glad you are looking forward to A-Z. I am dropping by to wish you the best. Carolyn I am sorry you are having such a bad year too. I hope the sun comes out for both of us real soon. What a wonderful theme! While we are doing well on raising awareness, it is never going to be where it needs to be, I fear. My husband suffers PTSD amongst other things and I am his caregiver. I nearly lost him several times to suicide. I write about my feelings as a caregiver on that blog. 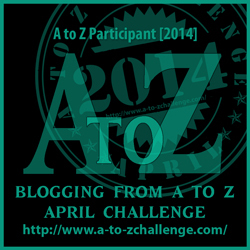 But my A to Z challenge is on my other blog. Good luck and thank you for being so open about this issue. I had no idea you were caring for your husband. My husband is a disabled vet too.Please give him my sincere gratitude. My husband is a disabled vet too. I will check out your other blog. I’m looking forward to catching up with you. Your plate has been more than full, Doreen, and I am so sorry for all of it. My prayers go out to you and your entire family. I agree with you about awareness on mental health. Ever since the Newtown incident, well actually before that, I’ve realized the need to spread awareness and educate others on the need to put the stigma behind us and move forward on this issue. Thank you so much Cathy. I am learning so much, while researching these posts. I feel like I’m in school again. I am really looking forward to the challenge. I am coming along to read your posts. I want to see how I can not be stuck in the grief as well. I am so sorry you are grieving too. Thank you for reading. I hope it helps Paula. I am sorry you are grieving too. I recommend the A-Z Kathy. It is challenging but very rewarding. Oh, my, I’m so so sorry to read about all of your challenges. You sound like a strong woman, though… and it’s good to immerse yourself in addressing important issues. Your plate has been full, Doreen, and not of good things. Kudos to you for showing strength in the toughest of times. Looking forward to reading your posts on such an important topic. Thank you Helene. I am learning an awful lot about mental health. that is so thoughtful of you.Doreen that is very sensitive theme all the best totally looking forward to it. Thank you so much. I wish you the best of luck with the challenge. Sorry to hear about your loss. May strength and peace be with you! You have taken a very important theme. I look forward to the informative posts here. Good luck with your posts. You are so kind. I wish you the best during the A-Z and always. So sensitive of you Doreen. Good luck with it. You will be doing good to many with this challenge. Thank you so much Sugandha. I wish you the best of luck with the challenge. Hi Doreen; You’ve certainly had a rough time; my sympathies! Glad you have the Challenge to take your mind off things. Mental Health is a very important topic and I look forward to your posts. Oh and how it will take my mind off the sadness! Thank you and the best of luck to you with the challenge. Sorry to read of your loss. Life throws us all sorts of curve balls and challenges, but it’s good to see that you have decided to deal with it in a positive way. Thank you so much Michelle. I know your posts will be making me smile. Good luck! It’s truly brave of you to make a conscious effort to pull yourself out of your sad thoughts. Looking forward to your posts. Thank you so much. I am looking forward to reading your posts as well. I’m sorry to hear about your losses. Your chosen subject will be an interesting one for me as I have characters with mental issues. Doreen, a warm tight hug to you for what you went through, are going through. I admire you for choosing this particular theme. I will be here to read them. Love to you! And God bless you. Thank you so much Vidya.Love, light and God Bless you too. Thank you so much Sreeja. I wish you the best of luck on the challenge. Very sorry to hear about your loss but also happy to see you bouncing back… looking forward to the posts on your chosen theme of mental health. All the best! Thank you so much Richa. Good luck with the challenge! Mental health is such an important topic – glad you’re sharing things about it in this year’s A – Z Challenge. I think you’re right, your post probably will help writers with their character development too. That is an interesting subject…. would love to read about that……. It’s good to hear you’re pushing through the pain of April and focusing on raising awareness for mental illness/health. I will definitely be using it as a reference guide, as one of my characters does suffer from mental illness, and I want to be sure to portray them correctly. Thank you so much Loni. As crazy as the challenge is I love it. What a terrible set of losses. I can only hope that the rebirth that spring always brings is a comfort. Mental health is an issue close to my heart for numerous reasons. Good on you for writing about it. I’ll be following! Thank you Carol. It is very close to my heart as well. Good luck with the challenge. Mental health is an important subject to cover. I hope it helps to take your mind off the heartache. Thank you so much. Good luck to you too! My condolences, it is never easy to lose people you care about. I hope this April goes well for you and you have a good time posting about Mental Health and meeting all the other bloggers. Good luck with everything. Thank you Corinne. This is going to be an exciting challenge. I am so sorry for your loss and think mental health is a great topic to write on. best wishes for the challenge and take care. Thank you, Sfurti. Yes there is so much more to learn. I am looking forward to your posts too. Looking forward to read your posts! All the best! Thank you Nabanita, I look forward to your posts too. Bringing about awareness is a great cause. Look forward to your posts. Thank you Suzy. I am looking forward to your posts too. a very good theme to keep all the participants mentally alert. We are all going to need help staying alert. Good luck with the challenge! That’s a wonderful theme and it’s going to raise so much awareness. I really hope so, thank you! Really sorry to hear about your losses, Doreen. I think Mental Health is a very necessary and valid theme for the times. Good luck to you and I will be stopping over to read you all through April. Sorry to hear about so many losses you have encountered these years. Take care and I will be looking forward to your busy April this year <3 Hugs!! Extremely sorry for your loss! Lots of positive light and strength to you. It is great that you are directing all your energy in writing! Mental health is a very imp issue often sidelined. I am so glad you have taken this up as your theme! All the very best! Thank you Aditi. I am looking forward to stopping over to see what your theme is. Good luck to you! Mental health- One of the topics which is kind off still a taboo. I am working hard to get rid of the stigma. Good luck for the challenge. The human condition is such a precarious one and especially the mind can go haywire or if held in the right balance can take us to great heights of peace. A good topic and looking fwd to the blog-challenge, take care. Thank you so much Sunila. Best of luck for the challenge. Thank you so much. I am looking forward to reading about your theme. Sorry to hear about your loss… A healthy mind always leads to a happy life.. Thank you Shiva. Yes it does lead to a happy life. Good luck with the challenge.